Check the link above for full details and titles you might want to catch. 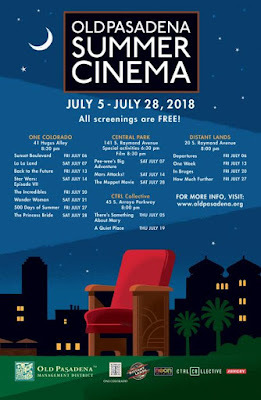 "Old Pasadena Summer Cinema returns for another year as a month-long, FREE movie series featuring 17 screenings in unique urban settings. 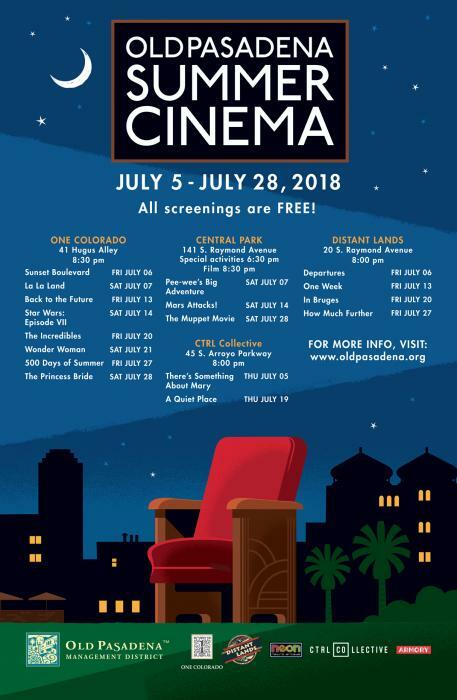 Running from July 5 – July 28, this annual summer film program celebrates motion picture in all forms, offering a variety of audience-pleasing movie titles and genres in diverse locales throughout the historic district of Old Pasadena. All screenings are free and open to the public. SATURDAY JULY 28: The Muppet Movie (1979) G. Celebrate the art and fun of puppeteering! Enjoy a craft with the Armory Center for the Arts, roving puppeteers, photo ops, face-painting, DJ sets from Glenn Red, and free treats from Paradis while supplies last." Enjoy an eclectic mix of comedy, theater and music in what LA Weekly describes as the “cutest little outdoor venue in town!,” all while supporting TreePeople. Nestled in the rolling hills of Coldwater Canyon Park, this summertime series showcases acts for the whole family to enjoy and takes place within the intimate S. Mark Taper Foundation Amphitheatre, a venue described by patrons as a "stunning setting among the trees." This year's lineup features Maz Jobrani, Louden Swain, annual favorite "Airplane! The Reading! !” and other special guests – including an opening night with comedian Paula Poundstone.